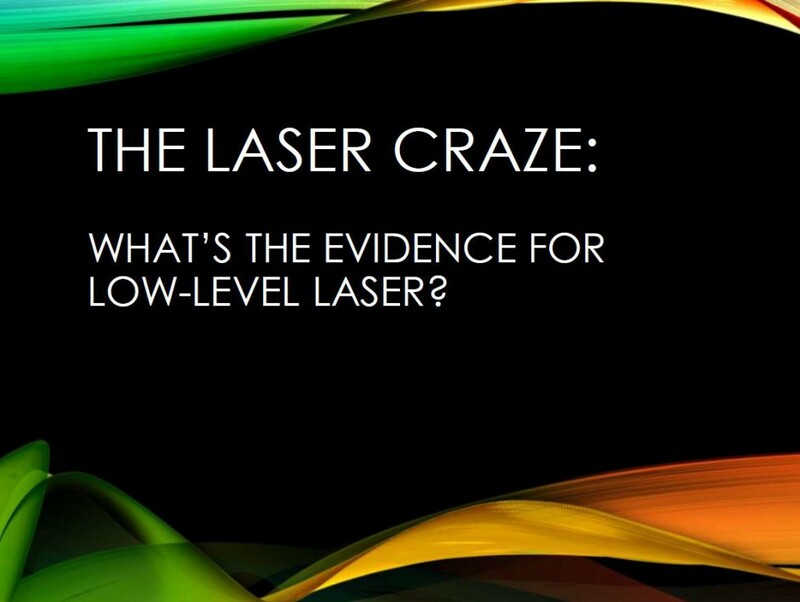 Here are my notes and slides from my presentation of low-level lasers. Laser therapy is, at its simplest, the application of light to living organisms to obtain health benefits. However, there is a bewildering amount of detail behind this simple idea. The wavelength and power of the laser used, the location and duration of exposure, the number of treatments, the conditions for which treatment might be useful, and many other variables are subject to extensive debate. Generally, low-level or “cold” lasers (which is really a misnomer since many do generate heat during use) utilize wavelengths between 600-1000nm and power levels from 5-500mW. More powerful lasers are used in surgery, but these function primarily to cut or cauterize tissue, break up uroliths, or otherwise cause controlled damage. Low-level lasers are intended to have biological effects on tissue, known as photobiomodulation, without causing damage. The FDA classifies lasers, from Class 1 to Class 4, based primarily on their potential to harm the user or the patient. Low-level laser therapy typically involves Class 3 lasers, though more powerful Class 4 devices are sometimes used for non-surgical therapy. WHAT ARE THE POSSIBLE USES FOR LASER THERAPY? The most common recommended uses of low-level laser therapy are to facilitate wound healing, reduce inflammation, and improve musculoskeletal pain or disease. However, proponents of laser therapy, and companies selling therapeutic lasers, often claim or suggest that low-level lasers can treat nearly any medical condition. Lasers have been promoted for use in specific clinical problems (allergic skin disease, gingivitis, bacterial and viral infections, envenomation, etc. ), vaguely defined general health improvement (enhancing immune function, normalizing metabolic function, “energizing” cells, etc. ), and unscientific nonsense (fixing “Qi-stagnation”1). Some practitioners recommend using laser as a means of stimulating acupuncture points, which adds the question of the efficacy of acupuncture and the selection of such points to the original question of the potential utility of laser therapy itself. Sorting through the claims made for lasers, from the reasonable to the ridiculous, is challenging due to the heterogeneity of lasers and therapeutic approaches employed and the complexity and inconsistency of the available research on medical lasers. WHAT IS THE EVIDENCE FOR LASER THERAPY? 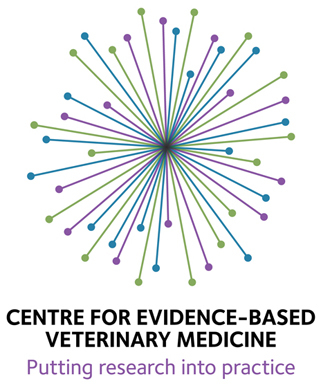 The principles of Evidence-based Veterinary Medicine (EBVM) can help us sort through the evidence concerning low-level laser therapy and try and identify the strengths and limitations of the evidence for specific potential uses. 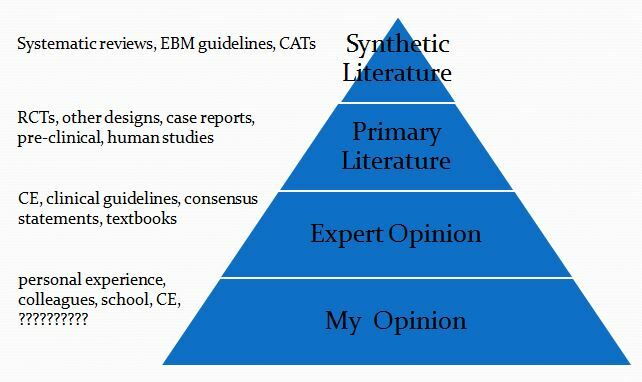 Though there are various ways to organize our evaluation of the existing evidence, it is generally agreed that some sort of hierarchy of evidence is appropriate, with the most reliable types evidence at the apex and the most available, but less reliable evidence, at the base. Figure 1 illustrates one way of visualizing such a hierarchy of evidence. Within the levels of this hierarchy, there are multiple types of evidence which themselves have different levels of reliability. Randomized clinical trials, for example, provide better evidence than case reports, and studies in the species one intends to treat are more likely to predict outcomes than studies in another species. However, this scheme provides a convenient overview of one useful way to think about the types of evidence available to guide decisions about the use of lasers. Systematic reviews of multiple clinical trials, with detailed analysis of the limitations of each trial and an overall assessment of the quality of evidence are the most trustworthy source of evidence on any clinical intervention. Unfortunately, such reviews are often not available in veterinary medicine, and there are none for low-level laser therapy. Controlled clinical trials of naturally occurring disease in the target species are the next most reliable form of evidence, and there appear to be none available for veterinary patients. Some studies in clinical patients do exist, though they have significant limitations. There have been many experimental studies of laser therapy for a variety of conditions in veterinary species, however the methodological quality is variable and the results are mixed. Some studies of wound healing, for example, show possible benefits4 while many others do not.5-9 Small studies looking at lasers for skin disease have also found mixed results (some beneficial effect on non-inflammatory alopecia10, no apparent effect on atopic pedal pruritis11), though again there are significant methodological limitations in these studies. The evidence, as usual, is much more voluminous for use of lasers in human medicine. There are literally hundreds of systematic reviews available for specific conditions, often with several different reviews of the same set of studies for particular indications. There is great inconsistency in the results. Most reviews conclude that the evidence is not strong enough to support definitive statements about efficacy. Some reviews do show some positive results, with weak to moderate evidence supporting a benefit for particular conditions, though in some cases other reviews of the same evidence reach different conclusions. There is an enormous body of in vitro evidence showing effects of laser light on various tissues. It is clear that laser has significant biological effects in such models, and some of the effects seen could potentially have clinical benefits in living patients. Finally, there are, of course, innumerable anecdotes regarding the effects of laser therapy, and some laser advocates are absolutely convinced by their own experiences that low-level laser is a powerful therapeutic tool. However, such anecdotal evidence can be found for most every intervention available, and equally strong anecdotal support by thousands of people over centuries has existed for many therapies that scientific research has shown conclusively to be ineffective, such as bloodletting and homeopathy. Therefore, the value of such evidence is limited to suggesting hypotheses for further research, and it cannot validate any claims about laser therapy. Most experimental and clinical studies of low-level laser therapy have found few adverse effects. Inappropriate use of higher-power lasers or excessive duration of treat can result in heating of tissues and thermal damage in some cases. There are also potential risks to operators of laser equipment. And in the absence of research evaluating the long-term effects of ongoing laser treatment, the potential for some of the many biological effects of light on cellular metabolism to result in harm is unknown. Safety guidelines, from government agencies, manufacturers, and the medical literature, are available and should be scrupulously followed. Lasers have significant measurable effects on living tissues in laboratory experiments, so it is plausible that they might have clinical benefits. The extensive research done in humans, however, has so far only found limited evidence to support the use of lasers in a few conditions, and high-quality controlled studies often contradict the positive findings of initial, small and poorly controlled trials. The experimental evidence in veterinary species is mixed and low quality, and there are no high-quality published clinical trials validating laser therapy for specific indications. It is possible that high-quality research may one day validate some of the claimed benefits for laser therapy. However, at present the best that can be said about this intervention is that it appears promising for some conditions, such as wounds and musculoskeletal pain. The growing popularity of lasers is based largely on anecdotal evidence and economic factors. Laser units are being aggressively marketed to veterinarians, often using unsubstantiated claims of clinical benefits. Laser therapy represents a potential source of income for practitioners and, of course, for laser device manufacturers. It appears likely that this profit potential contributes to an enthusiasm for laser therapy not matched by the quality of scientific evidence for its benefits to patients. Veterinary therapies often lack robust high-quality clinical trial evidence to support their use, and this is not itself a reason to avoid these therapies. However, when employing interventions that have not yet been rigorously demonstrated to be safe and effective, we have a duty to acknowledge the limitations of the evidence. Clients should be fully informed about the uncertainties concerning the effectiveness of laser therapy and the potential for unforeseen effects. Established therapies with stronger evidence identifying their risks and benefits should take precedence over promising but unproven therapies like laser treatment. And those interested in promoting low-level laser, particularly those marketing laser equipment and training, should proportion their claims to the available evidence and assume some responsibility for developing the evidence base further so that practitioners and animal owners can make better-informed decisions about this practice. Draper WE, Schubert TA, Clemmons RM, Miles SA. Low-level laser therapy reduces time to ambulation in dogs after hemilaminectomy: a preliminary study. J Small Anim Pract. 2012;53(8):465–469. Williams, C. Barone, G. Is Low Level Laser Therapy an Effective Adjunctive Treatment to Hemilaminectomy in Dogs with Acute Onset Parapleglia Secondary to Intervertebral Disc Disease? Proceedings, American College of Veterinary Internal Medicine Forum, Denver, CO. June, 2010. Grayson LC; Cassie NL; Juergen P. et al. Effect of laser treatment on first-intention incisional wound healing in ball pythons (Python regius). Am J Vet Res. October 2015;76(10):904-12. In de Braekt MM, van Alphen FA, Kuijpers-Jagtman AM, et al. Effect of low level laser therapy on wound healing after palatal surgery in beagle dogs. Lasers Surg Med. 1991;11(5):462-70. Petersen SL, Botes C, Olivier A, et al. The effect of low level laser therapy (LLLT) on wound healing in horses. 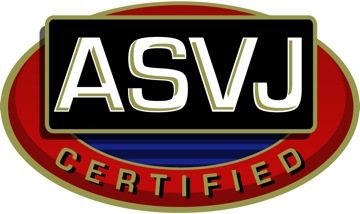 Equine Vet J. 1999 May;31(3):228-31. Lucas, C. Criens-Poublon, LJ. Cockrell, CT. et al. Wound healing in cell studies and animal model experiments by Low Level Laser Therapy; were clinical studies justified? a systematic review. Lasers Med Sci. 2002;17(2):110-34. Couldn’t have come at better time. Had the hard sell 2 days ago-had Martin in to listen with his forensic brain. Asked hard sell woman about safety factors without satisfactory response. Next step was to talk to your mate down south. Thank you for taking the time to post such thoughtful analysis of vet treatments. I am considering laser therapy for my dog’s arthritis and hip dysplasia. Surgery is not an option right now and she still experiences some pain despite being on Rimadyl. Some of the other painkillers (gabapentin) have really knocked her out. She is also already at a healthy weight, so I feel like I’m running out of options. You indicated that there might be some beneficial effects for bone healing, might this also apply to arthritis? Low-level laser therapy reduces time to ambulation in dogs after hemilaminectomy: a preliminary study. Draper WE1, Schubert TA, Clemmons RM, Miles SA. I realize most of these aren’t studies of dogs, but I wasn’t sure if the laser’s impact on joints/bones might be similar regardless. These are a few of the literally hundreds of such studies on low-level laser therapy. They are, as you say, not clinical studies of dogs with naturally occurring disease, so we have to be cautious in extrapolating from them. They also use a variety of laser protocols (different wavelengths, total dose, duration, etc. ), so again it’s hard to know which protocol, if any, is likely to benefit your dog. I don’t see any harm in trying so long as you are already doing those things that we have better evidence for, such as NSAID treatment and weight management, which you have. The result is unpredictable, but that is almost always the case.